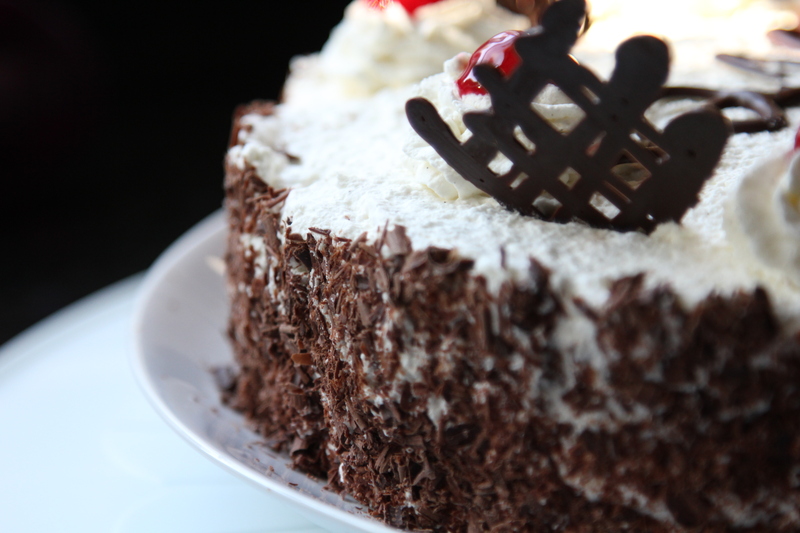 Black Forest Cake [Recipe] – Cin Cin, Let's Eat! Lots of birthdays in October, especially for both my parents and my husband. The past couple of years, we’ve been celebrating all three birthdays jointly since it’s hard to get everyone together. This year I thought I’d make the cake and make my family my guinea pigs. 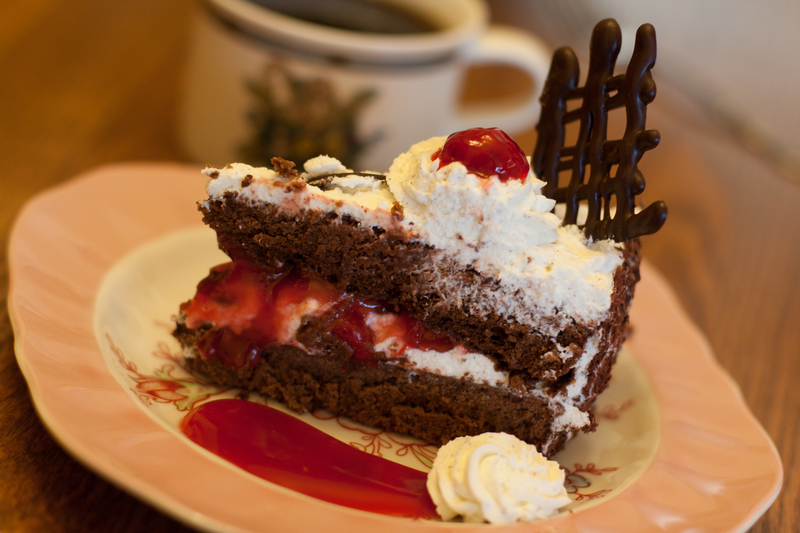 It’s hard to decide what kind of cake to make, and I remembered the recipe card I got when I visited the House of Black Forest Clocks in Hornberg Black Forest, Germany…You guessed right, it’s a recipe for “Schwarzwälder Kirschtorte” aka the black forest cake. My parents spent some time living in Germany when they were younger so I thought this cake would be pretty cool, as far as for my husband, he doesn’t say no to any types of cake. Here is the recipe from the shop, and I also added more details or substitution below. Add the cherries with juice with 2 oz. of sugar. Bring to a boil. Separate cherries from juice, bring 1 cup of juice to the boil. Mix the corn starch with a little bit of water until smooth. Add the corn starch mixture to the cherry juice, boil for 1 min. Add cherries and the Kirschwasser liqueur, let it cool down. Whip cream with sugar & vanilla sugar. Refrigerate until ready to assemble. Cut the chocolate sponge cake in two or three layers. 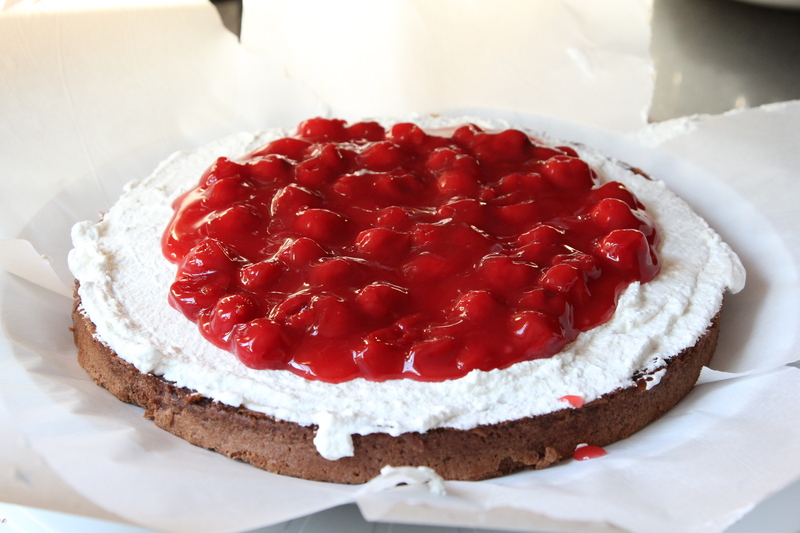 Cover each layers with cream & cherries. 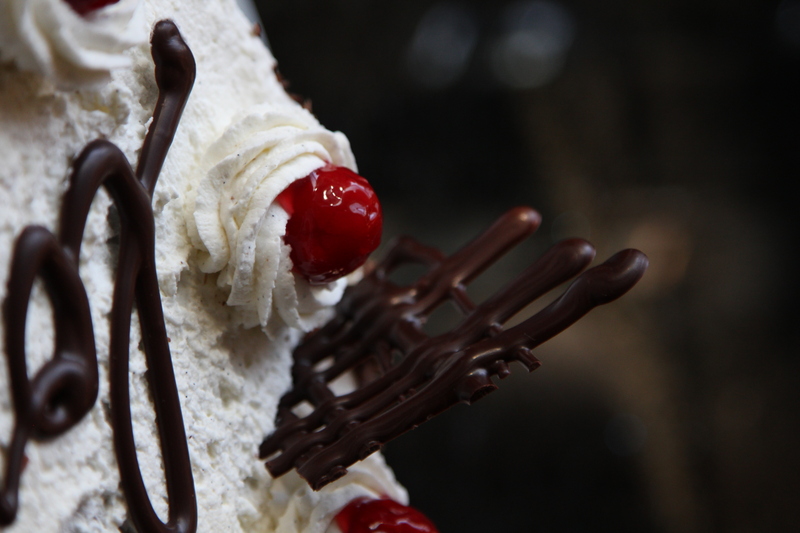 Cover the whole cake with whipped cream, decorate it with chocolate shavings and garnish with cherries! The following recipe is a very straight forward sponge cake recipe. No oil, no leavening agent. The key is in the eggs and how well you beat it. The cake will rise depending on how much air is in the egg batter. One recipe yields one generous layer, thus I made two batches for two layers of cake. Grease and line the bottom of a 9-inch springform pan with parchment paper. Beat eggs in a medium bowl until it triples the volume and the color turns pale white-ish yellow, about 8-10 minutes. Gradually add in the sugar, vanilla, and salt. Mix well. Stir in the melted chocolate chips. Drip the chocolate in slowly. If you add it too fast, the chocolate will cool and clump up, you’ll end up with lumpy batter. Gently fold the flour into the batter. Pour mixture into the pan and bake for 35 minutes. I heat up the extra chocolate chips I have on hand in a double boiler, put the melted chocolate in a small ziploc bag, cut a little hole on the side and just pipe out designs and writings that I want. I used a heart-shaped cookie cutter to cut the heart shape chocolate. Don’t wait until the chocolate completely hardens to cut it, you’ll break the chocolate that way. I waited until it was half cool, press the cookie cutter down, and pop the whole thing in the fridge for a quick cool-off. 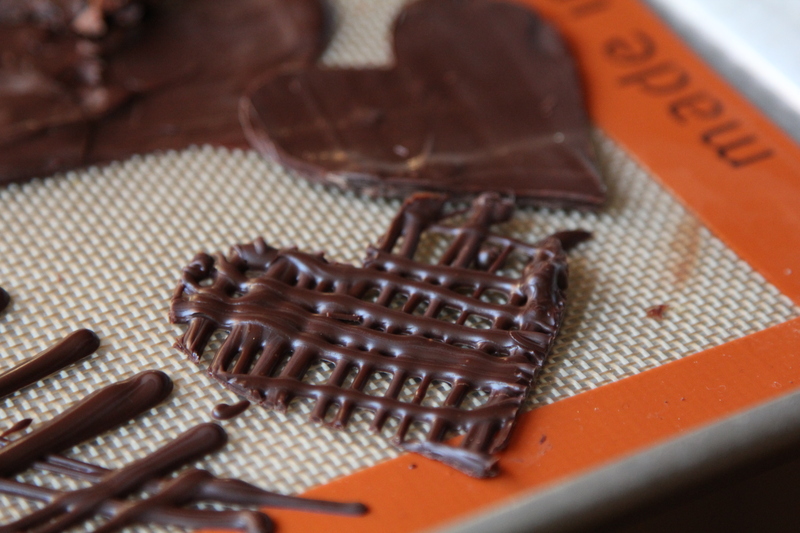 Use a flat spatula to remove the chocolates. I broke up the remaining pieces of chocolate shapes and placed them on the cake. I omitted the gelatine from the recipe as it only acts as a stabling agent for the whipped cream. I generally don’t use it. to make vanilla sugar (vanillezucker)- scrape down the insides of 1-2 vanilla beans, mix with 2 cups of granulated sugar. German desserts recipes often call for vanilla sugar. One package of vanilla sugar = 1.5 tsp. You can substitute one package of vanilla sugar with 1 teaspoon of vanilla extract. Trader Joe sells Morello cherries in a jar. Those are perfect for this recipe. If you cannot find Morello cherries or any sour cherries in juice, use a can of cherry pie filling. Mix the cherry pie filling with 2 tbsp of sugar, bring to a boil, then add the kirsch liqueur and let it cool down. No need to add cornstarch since the pie filling is already thick. I got the Kirschwasser from Germany. You can use any kirsch (cherry) liqueur that you like. It’s not the clear colored cherry brandy. This particular one that I am using is a cherry liqueur that has a 10-year-old cherry brandy mixed in. One of my favorite cakes of all time. I have a very good recipe but I am going to try yours the next time. We love traveling to Germany…just returned. This is not a cake that is easily found during your travels unless you are in the Black Forest and even then it is illusive. 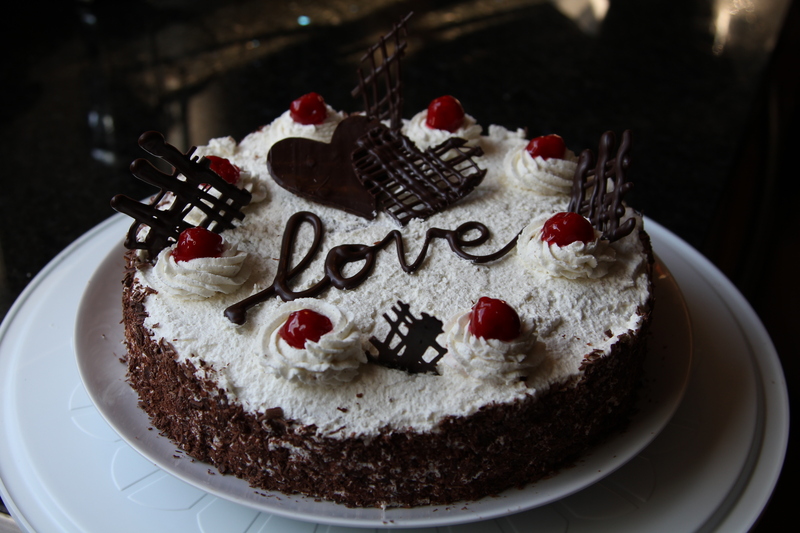 Such a great topping since so much love went into this cake. 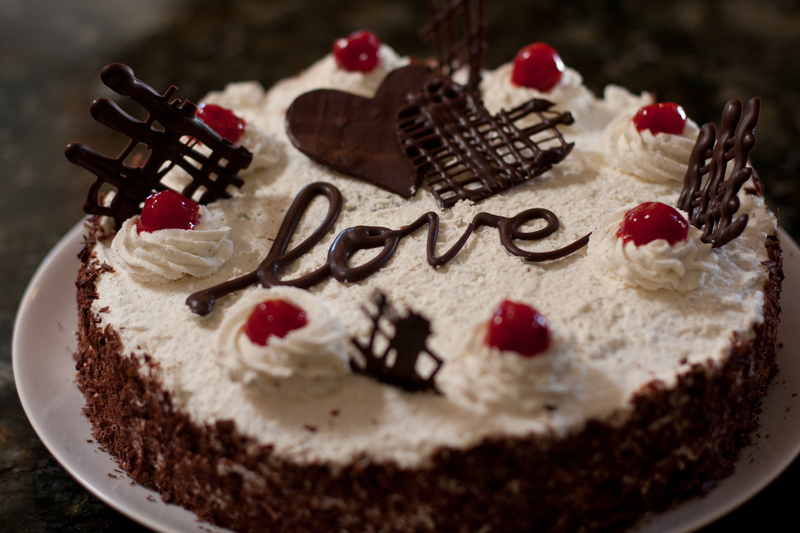 Love in cake form! ❤ it!! i had this for lunch… deeee-liii-cioussss. thanks lover! Threvini On July 13 wednesday Brithday.